I was given a couple of emergency lights which were being taken out of service because the batteries had deteriorated. I wondered about installing one above the stairs in my home, as it would be a useful safety feature in the event of a power cut. But how much power does one of these things use? The "ratings plate" gave no indication. The 8 Watts referred to is the power of the fluorescent lamp - but that only runs when the mains power is off. 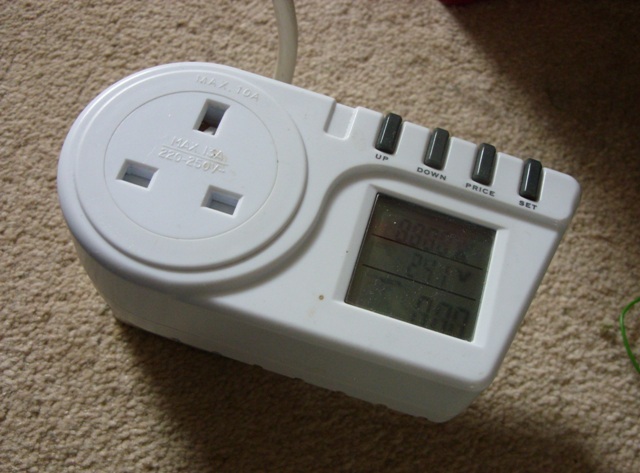 There is no indication of how much power is used from the mains to charge the batteries. I decided to measure it using one of those plug-in mains power meters. And was alarmed to see a figure of 40 Watts displayed. Now later I realised that there was a very small decimal point in between the digits and the actual level is more like 3.5 or 4.0 Watts! But even that is still a significant amount of power when the device is on 24 hours a day, 7 days a week. It works out at 35 kilowatt hours each year - or a few pounds-worth of electricity. Some of my colleagues suggested that the charge circuit would probably shut off once the batteries were charged, so then the consumption would drop. I took a look inside the case, but the circuit looked suspiciously simple - so how does it work? There is a mains transformer, and a watty resistor (R1). There is another, smaller transformer and some components that probably form a invertor circuit to light the fluorescent lamp. But there is very little in the way of logic circuitry - and the relay RL1 is conspicuous by it's absence! So after a few hours of work with a magnifying glass, and a resistance meter I worked out the circuit is as shown below. The mains comes into the mains transformer and passes through a bridge rectifier. The supply at this point measures about 10.3 Volts. The charge circuit is really simple: There is a 50 ohm wire-wound resistor which limits the current into the 3.6 Volt battery. There is a red LED across the 50 ohm resistor, which lights up to indicate that there is Voltage being dropped across the resistor, and hence current flowing into the battery. With 3.6V across the battery, there is 6.7 Volts across the resistor - using ohms law, the charge current works out to be about 134mA. With fully charged NiCds the battery Voltage will rise a little, but the charge current is unlikely to be less than 120mA. So the charge circuit consumes about 1.3 Watts all the time - even when the batteries are fully charged. The rest of the circuit uses very little power because TR2 is switched off during charging. The zener diode, ZD1, measures about 7.5 Volts, so with a 10.3 Volt supply, the base of TR1 has about 2.5V on it and will therefore conduct from collector to emitter - that, in turn, pulls the base of TR2 low and switches it off. When the mains supply goes off, no current flows back into the transformer because of the bridge rectifier, but the supply Voltage drops to 3.6V, and this is much less than the zener Voltage so TR1 turns off, TR2 turns on, and the power oscillator, formed around the two BCU81 transistors and a rather complicated little transformer, springs into life. So I worked out that the charge circuit uses about 1.3 Watts, and yet the measured power consumption was 3.5 Watts. How so? The rest of the power must be wasted in the mains transformer, which does get quite warm to the touch after it has been on for a while. Indeed the whole metal case of the lamp feels warm - which also suggests that there is some wasted power. Many buildings have a considerable number of these emergency lights. I would like to think that more modern designs with LED lights would use less power, but the figure is seldom quoted in advertising or in catalogues. If the charge circuit were made to shut off when the batteries were charged, then other battery technologies could be used, such as NiMh or Lithium Ion - Nickel Cadmium cells are one of the few types which can be continuously charged in this way.